Greg Judy is available for speaking engagements. 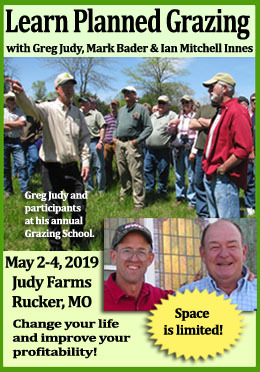 Click to visit the On Pasture’s Speakers Bureau for more information. Hello From Green Pastures Farm! Things haven’t been so green this summer thanks to very little rainfall this past winter, spring and summer. But what you’ll see in this video is a lot of green grass. Why? 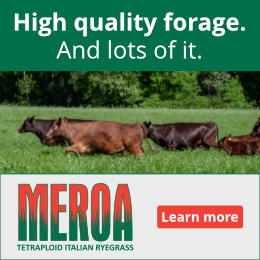 As I describe in this video, we manage our pastures to get plenty of rest, and to leave plenty of residual behind. In this case, we ran our cattle in one herd in small pastures, so that we could provide 85 days of rest. Everything was brown and burned up and nothing was growing. Then, the first week of September, we got 5.5 inches of rain over a two-day period. Because we’d left plenty of residual behind, the grass was able to respond quickly and we have grown tons of winter stockpile in the last 3 weeks. We’ve adjusted our grazing management to match up with the new conditions. We are speeding up the moves – we’re at 30 days now – and putting cattle in bigger pastures so they only graze the tips of the plants. We’re putting excellent conditions on our cows and calves and we have 20 to 30 days to grow stockpile before we have a killing frost. What I want to emphasize is when you leave 6-8 inches behind, keep the cattle moving, you’ll have better results. Enjoy this visit to one of our pastures! 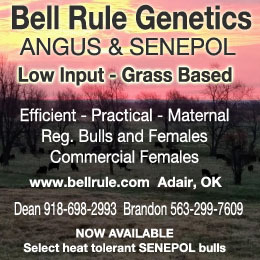 If you like the kind of cattle we raise, you might like one of our bulls. Though the South Poll was bred for the hot humid south, their range is expanding. Our bulls are doing well from Utah all the way to the east coast and from Nebraska all the way down to the Mexico border. I even have several producers with them in southern Minnesota. If you’re interested, you can learn more about our bulls and how we raise them here.